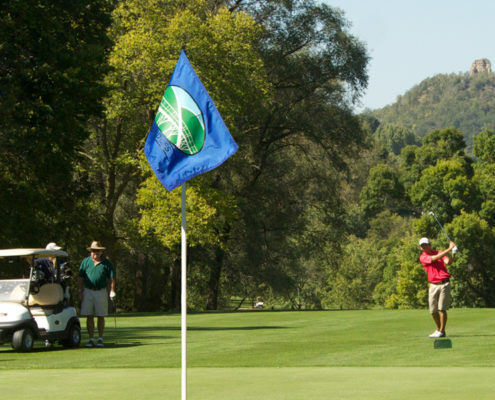 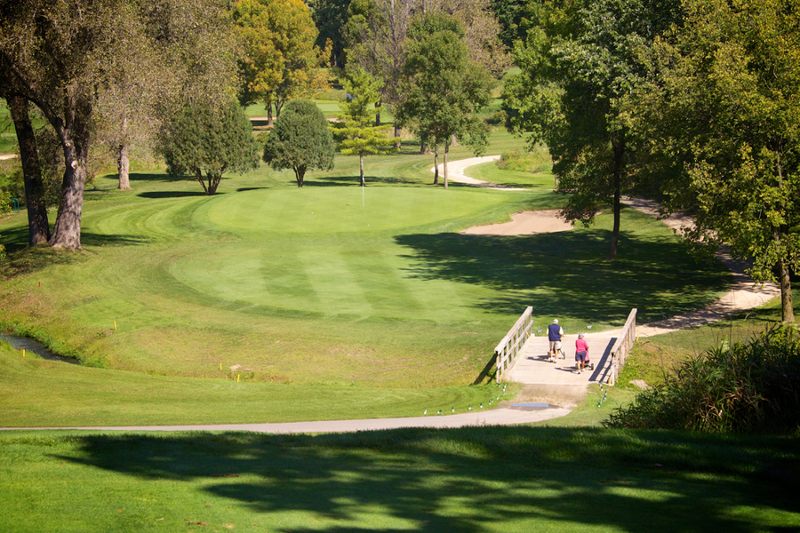 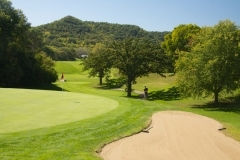 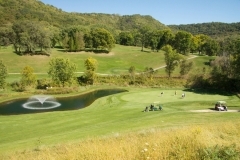 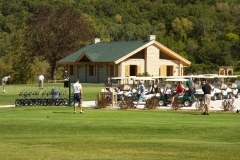 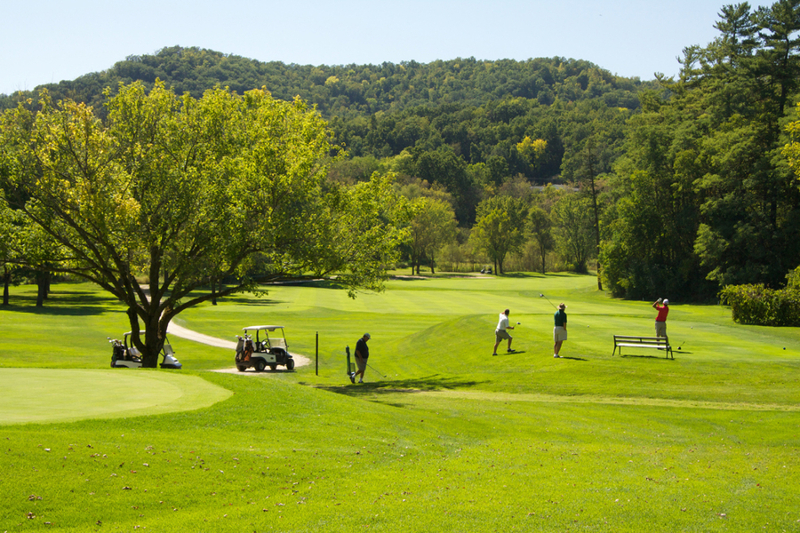 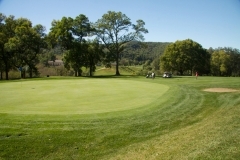 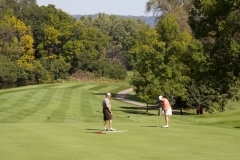 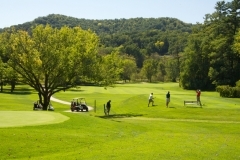 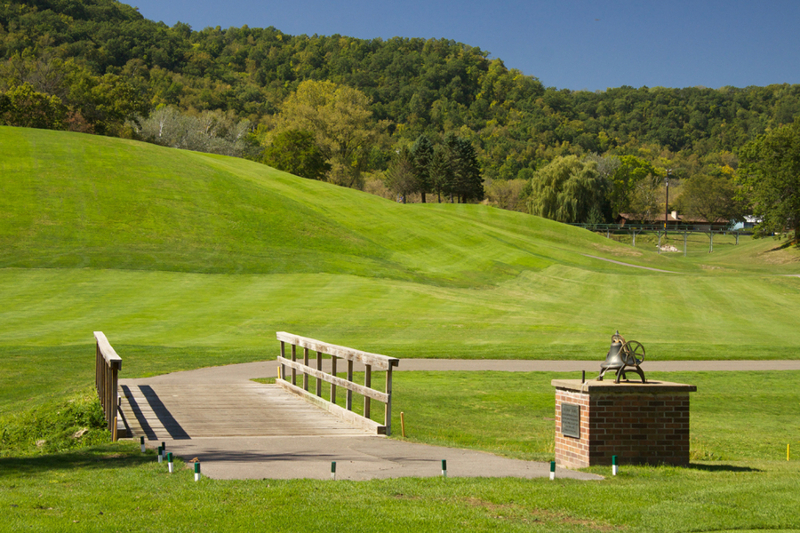 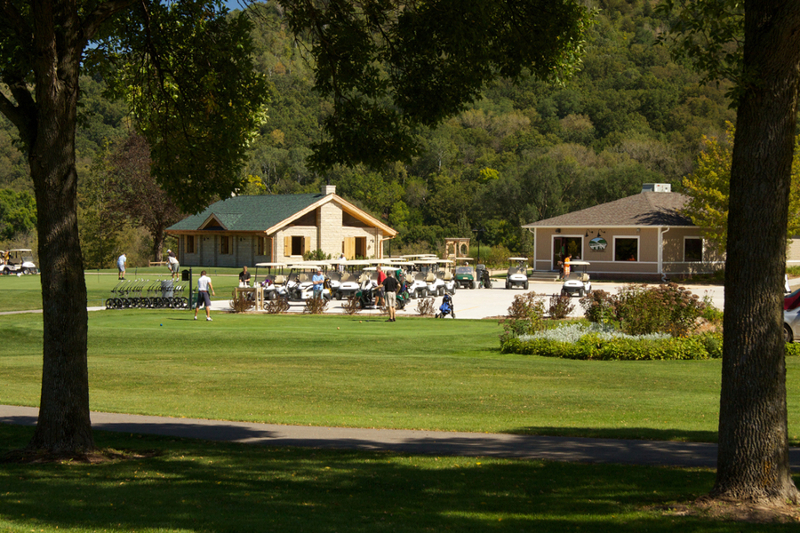 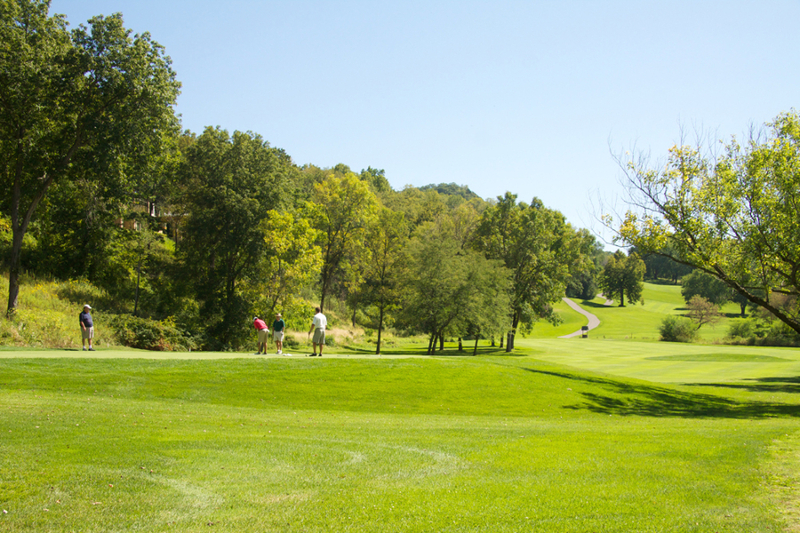 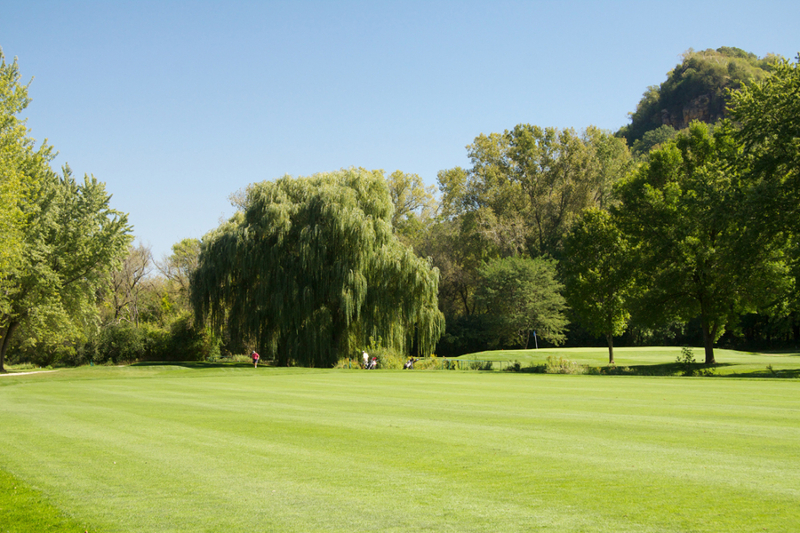 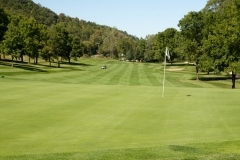 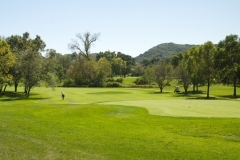 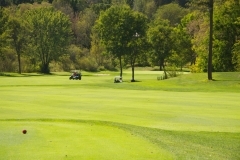 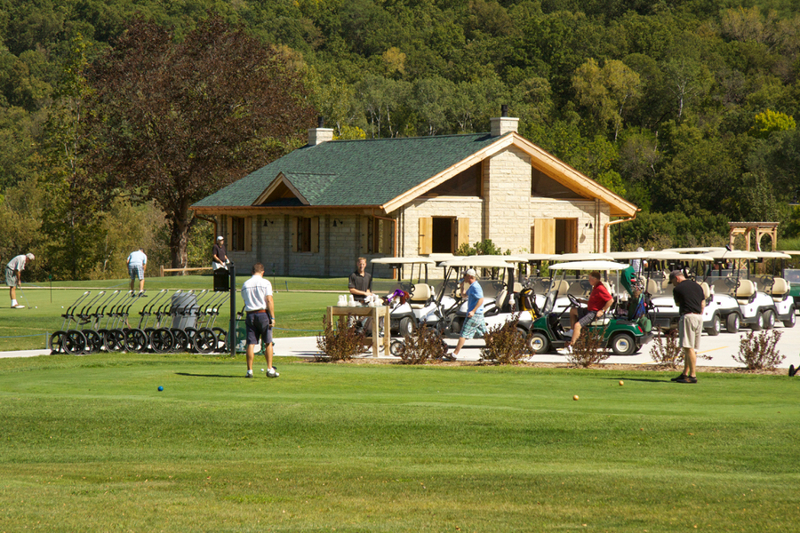 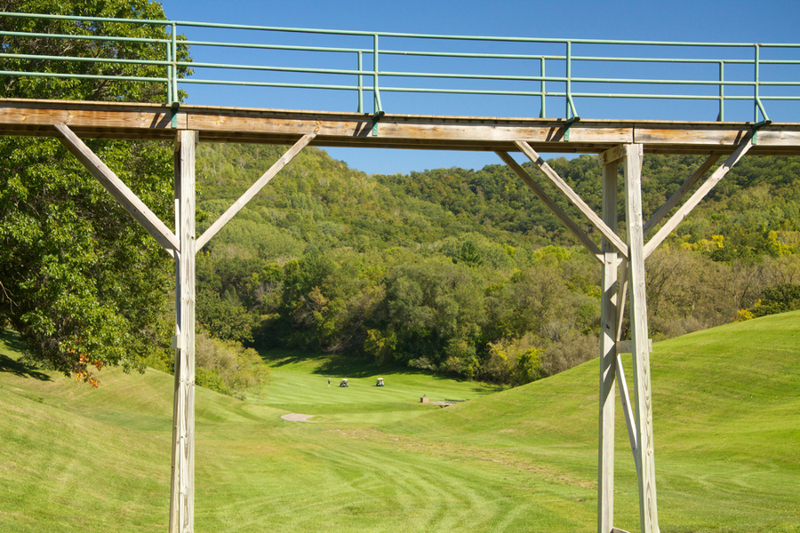 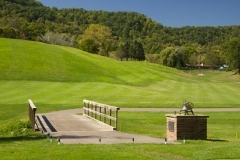 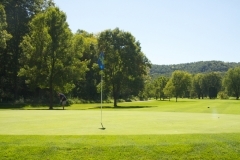 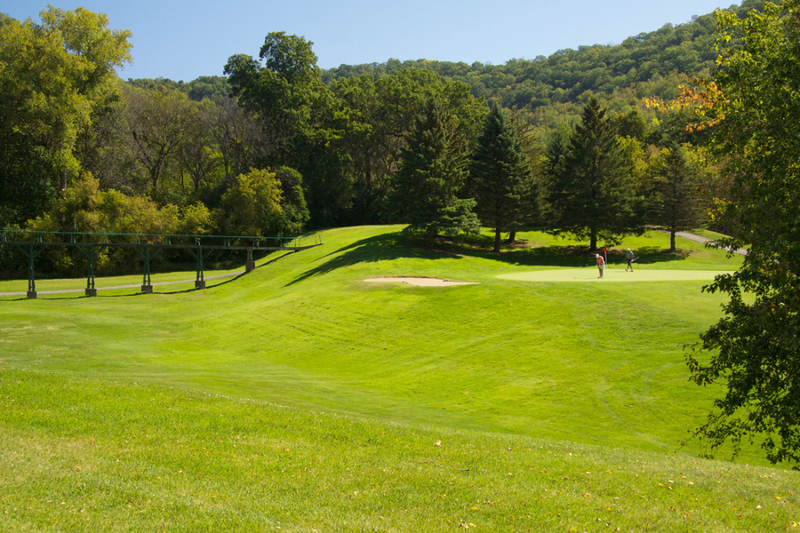 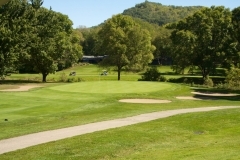 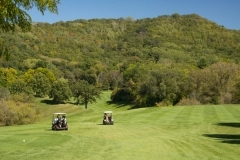 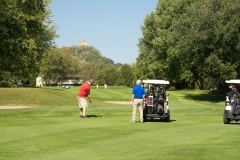 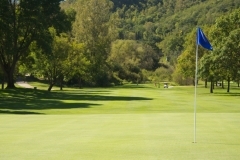 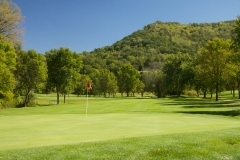 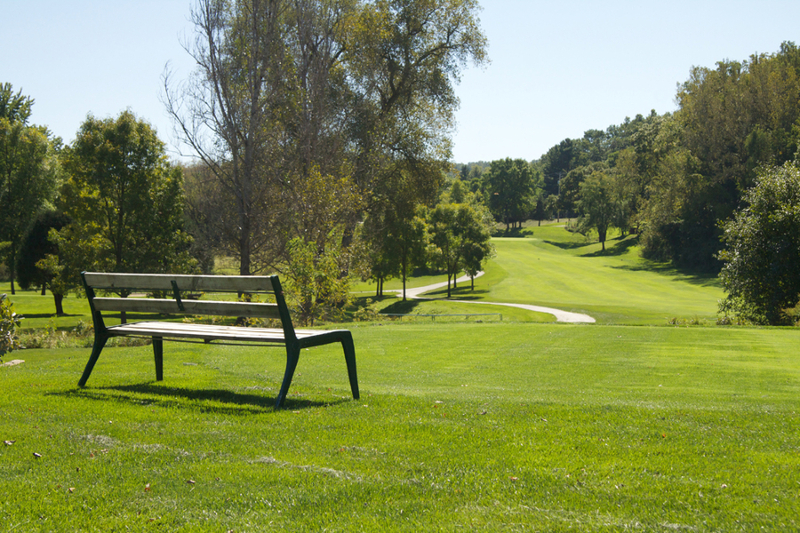 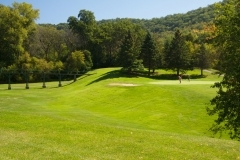 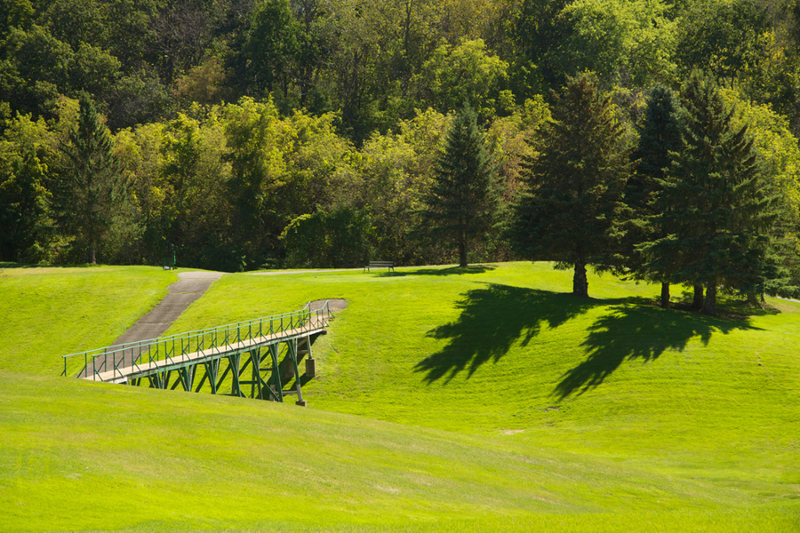 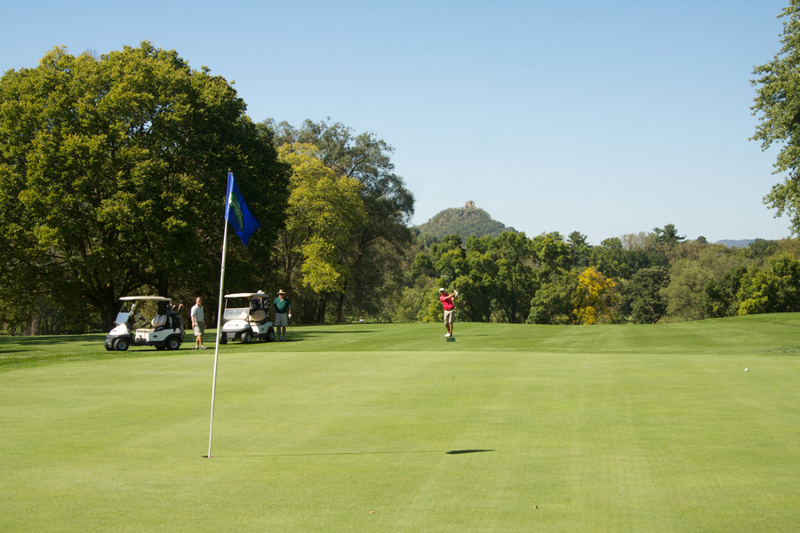 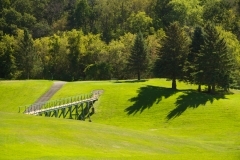 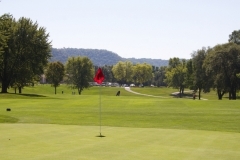 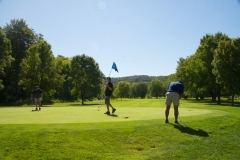 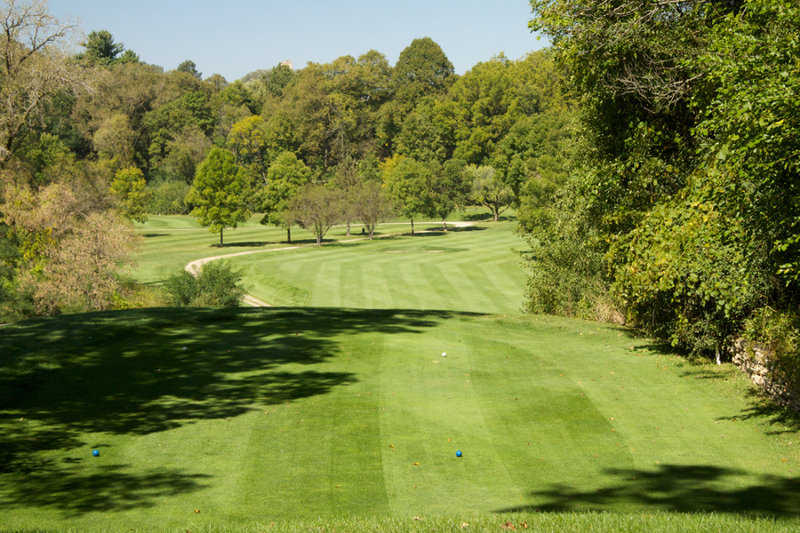 Set in Beautiful Pleasant Valley, the Bridges (formerly the Winona Country Club) offers striking vistas and a challenging golf course. 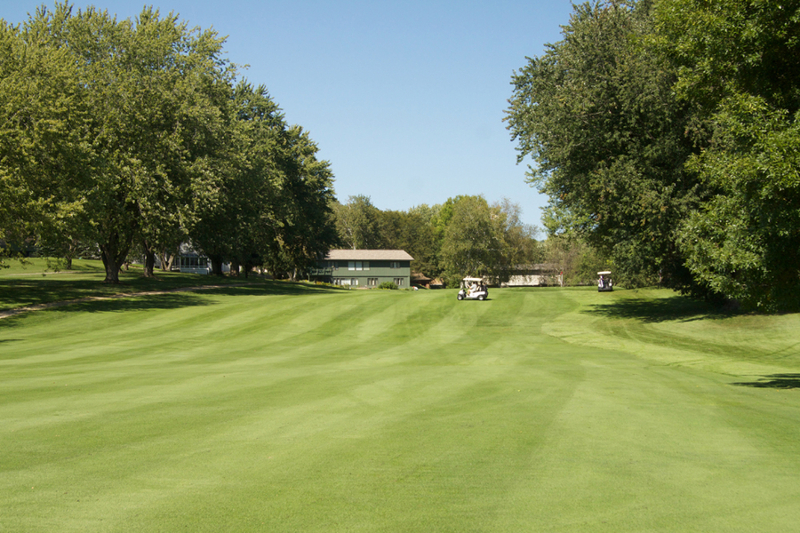 Pleasant Creek winds through the course, coming into play on nine of the eighteen holes. 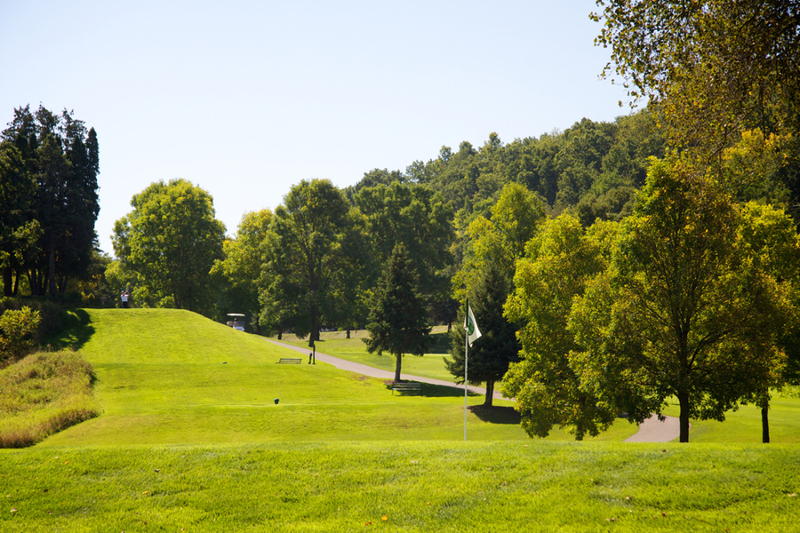 Multiple tees and several elevation changes give all players the opportunity to challenge their game. 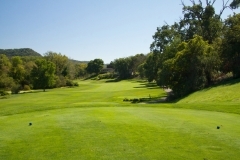 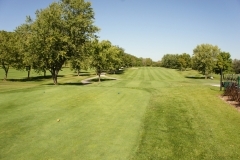 Click here to view a course tour in photos. 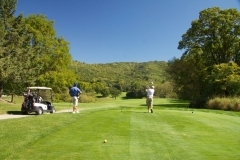 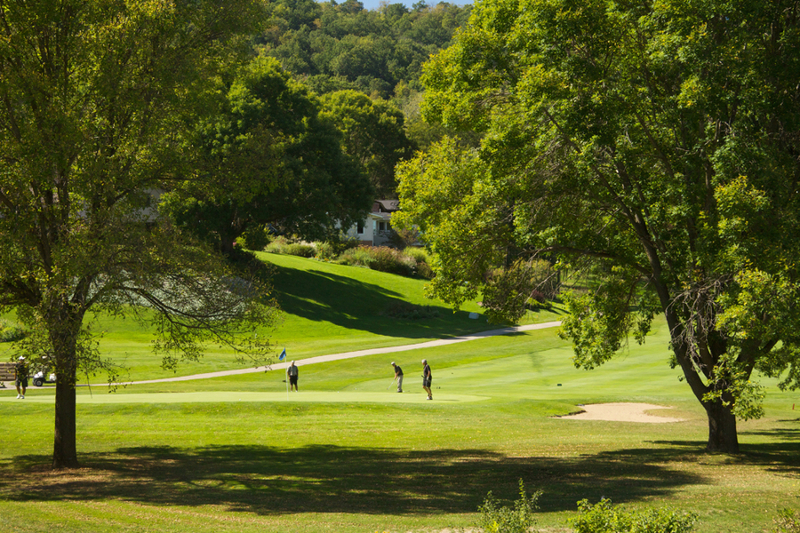 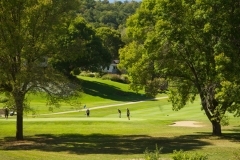 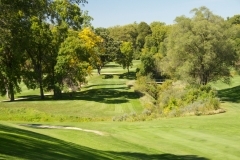 Opening for play in 1920, the club’s original course was designed by Ben Knight, the club’s first golf professional. 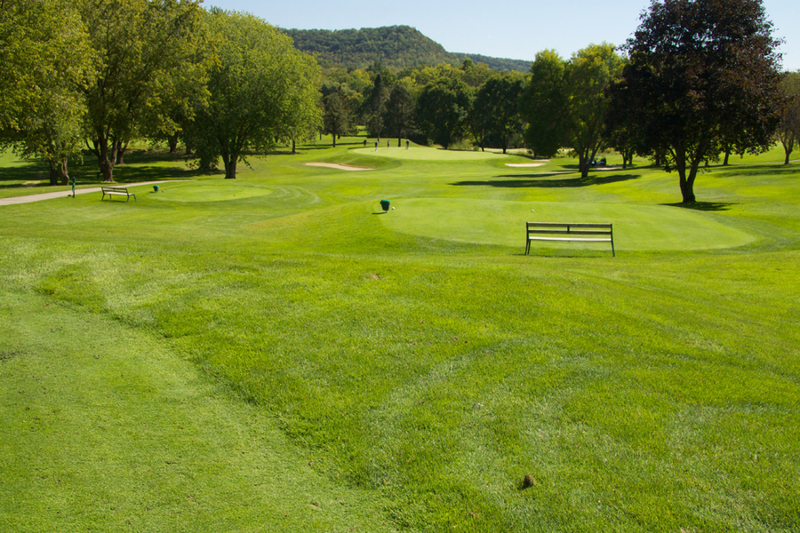 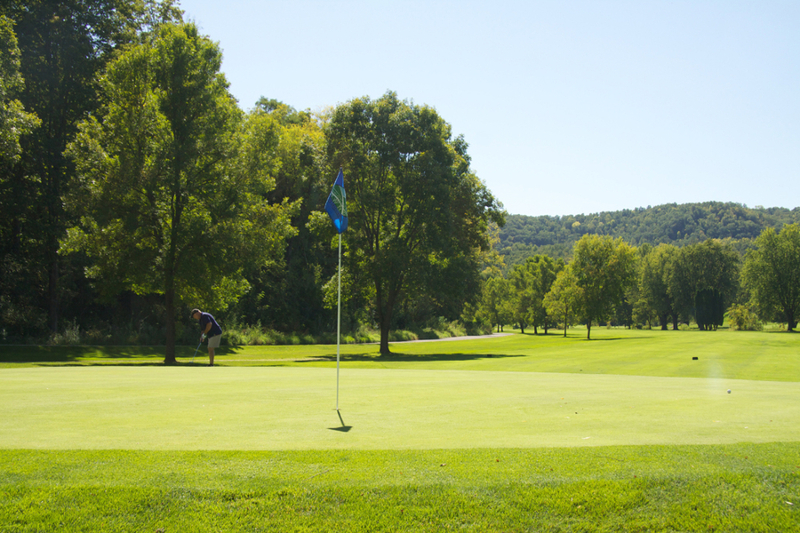 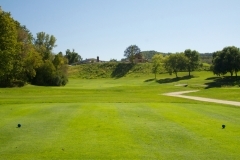 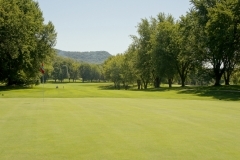 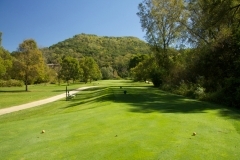 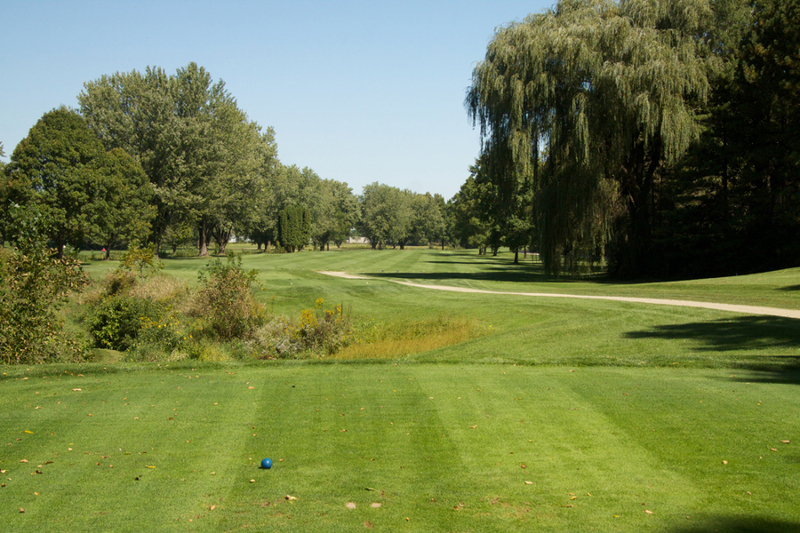 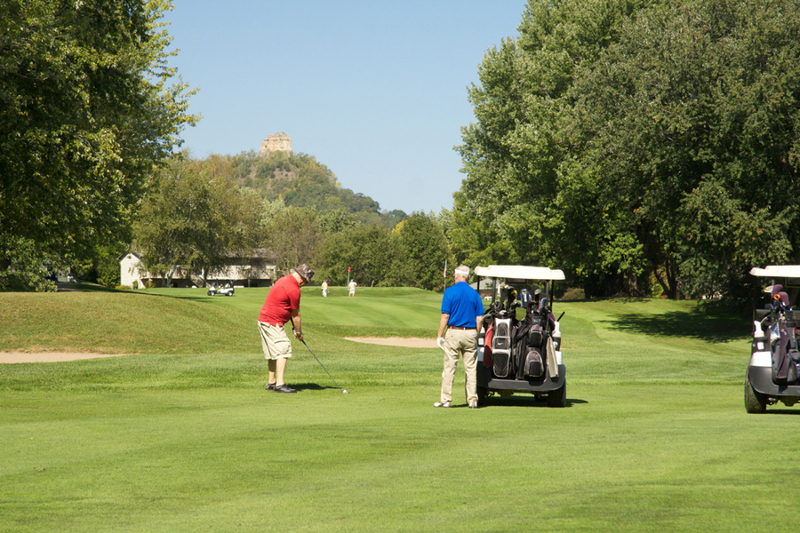 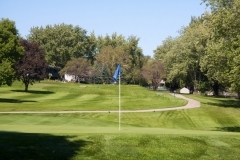 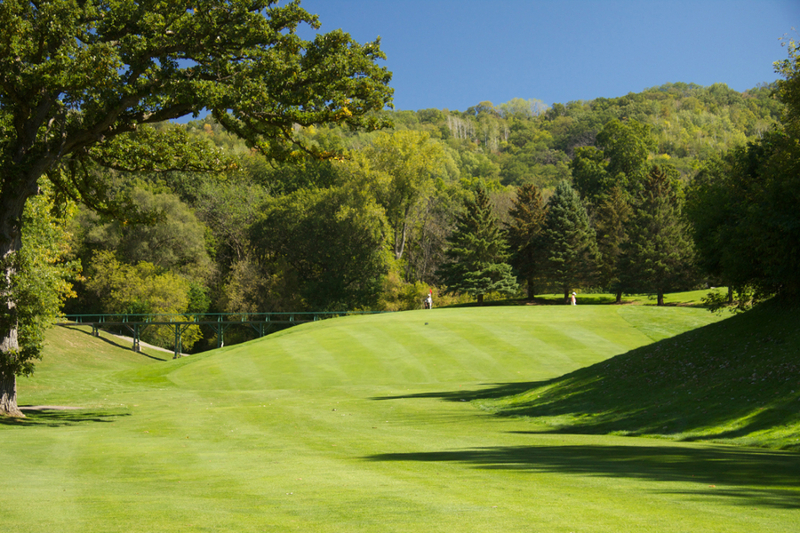 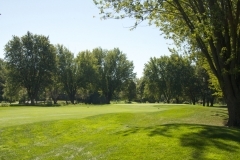 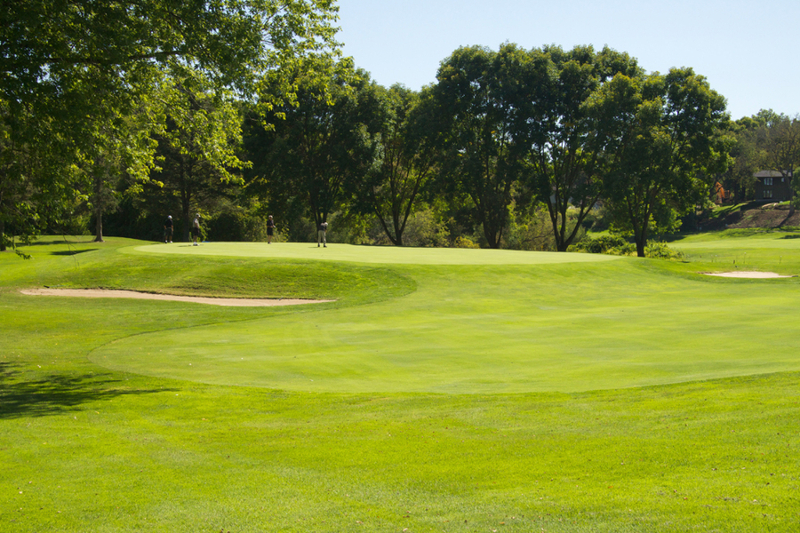 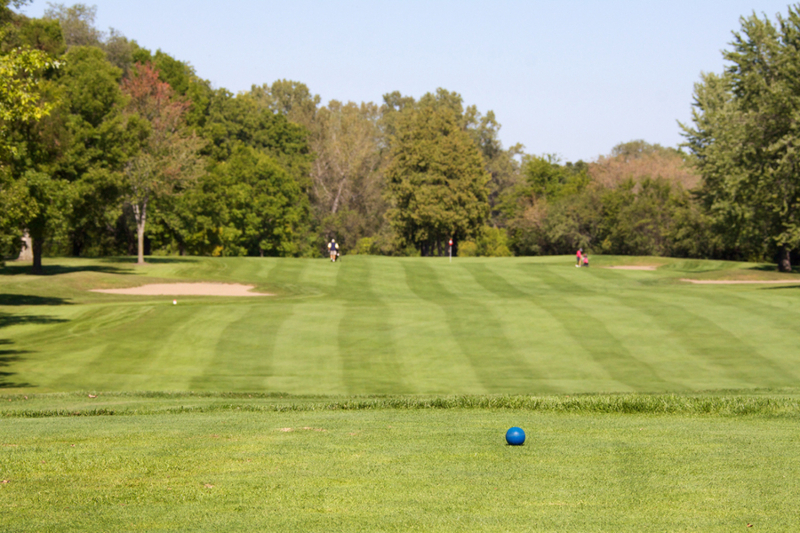 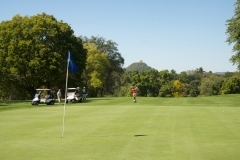 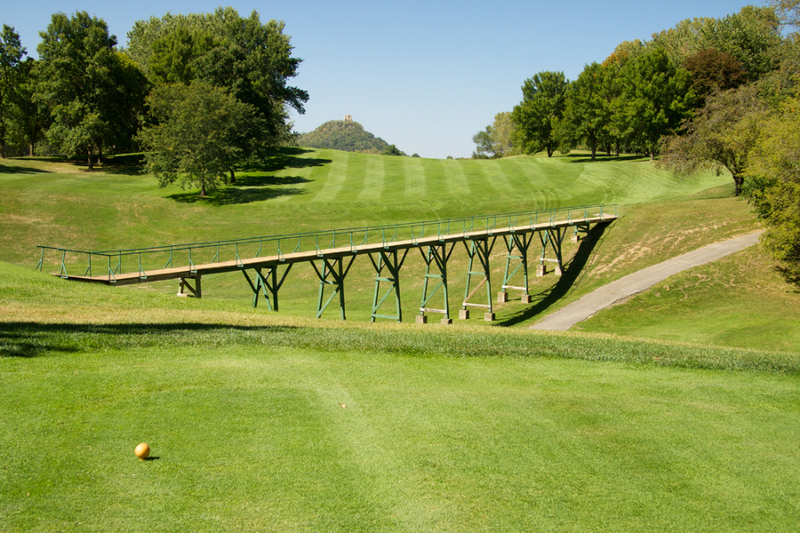 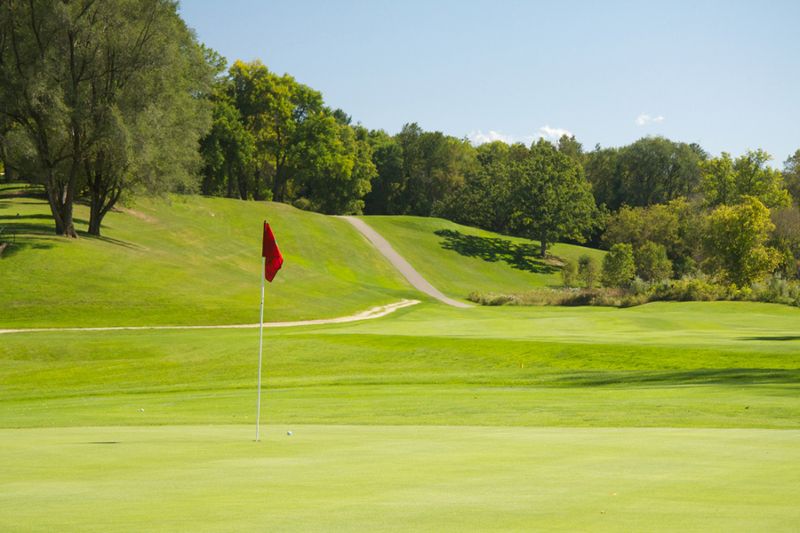 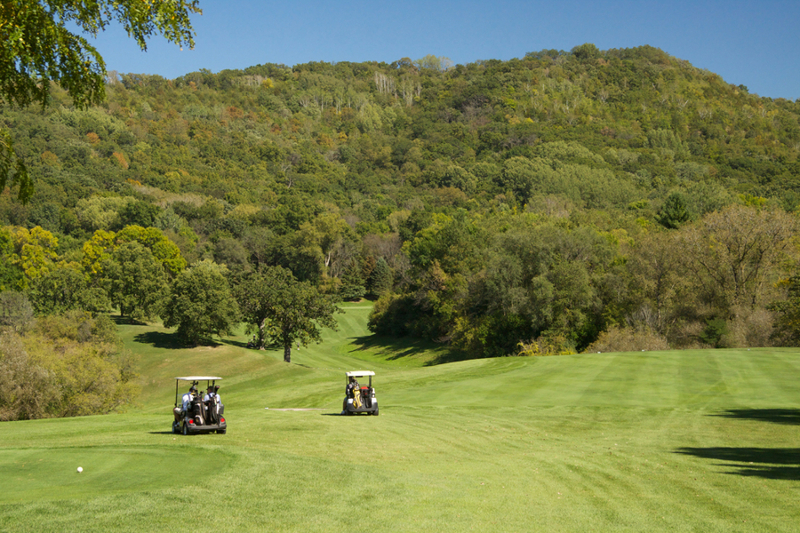 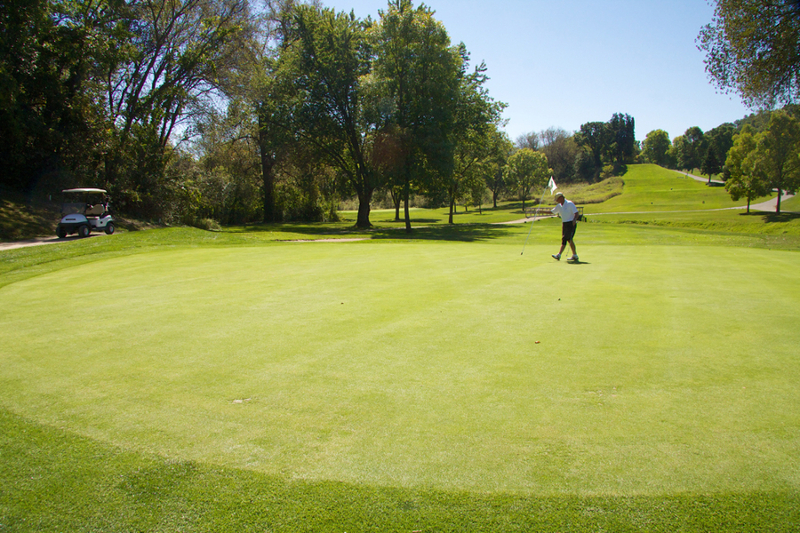 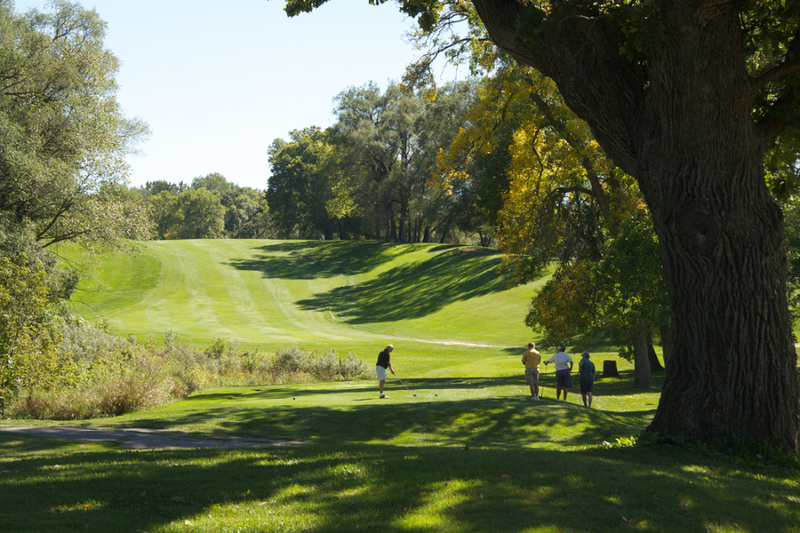 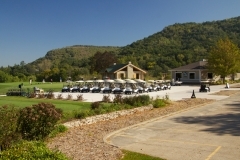 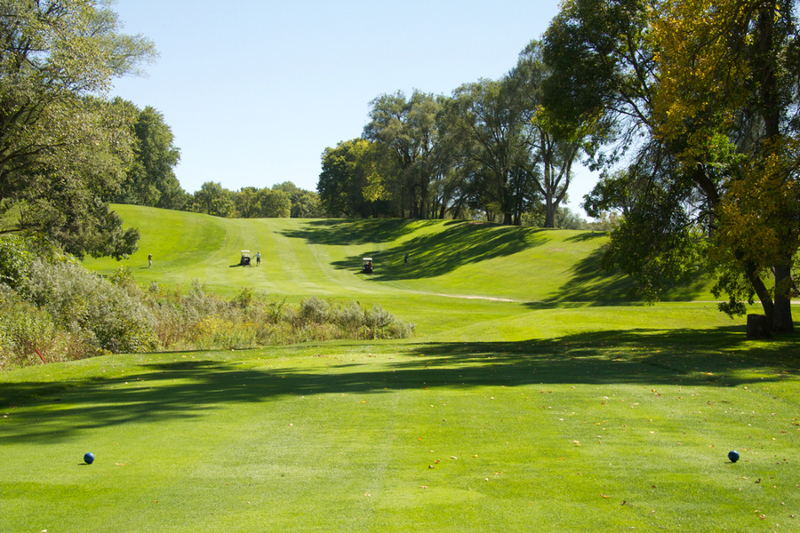 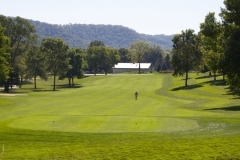 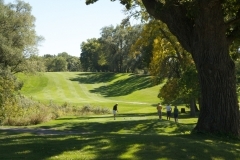 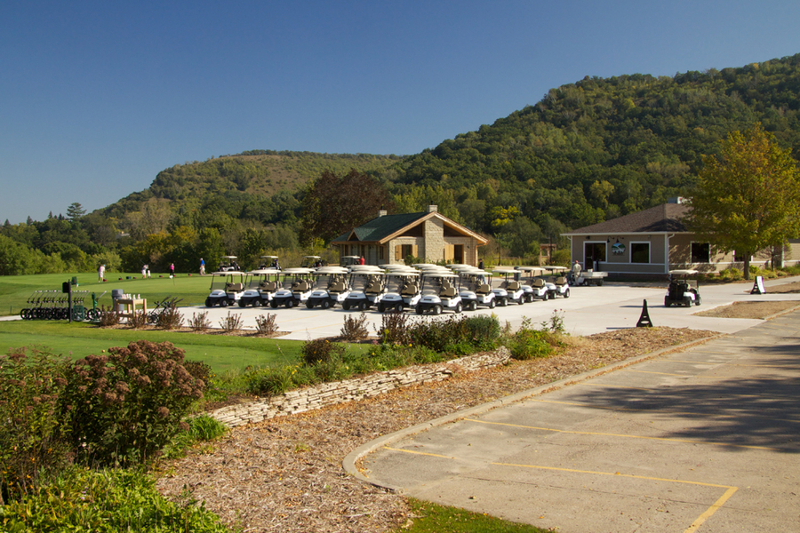 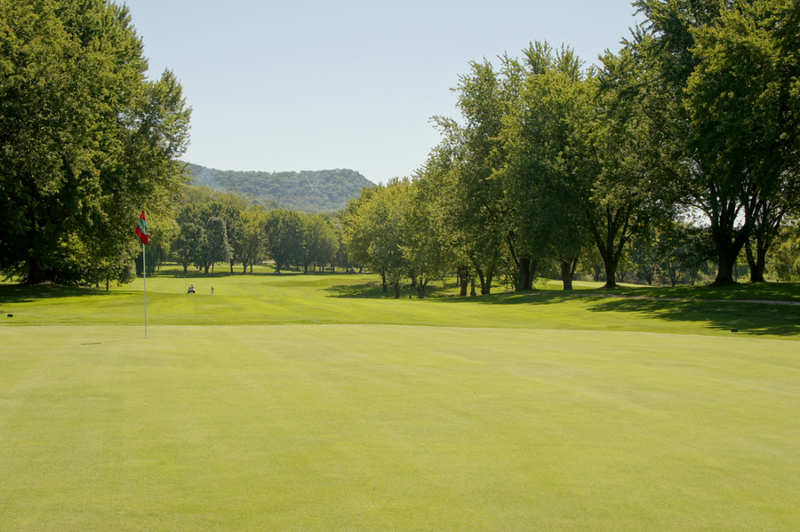 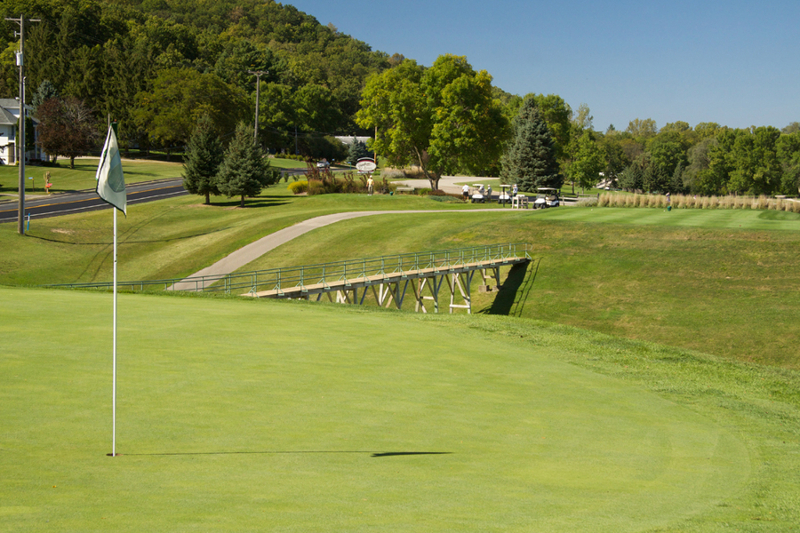 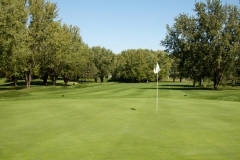 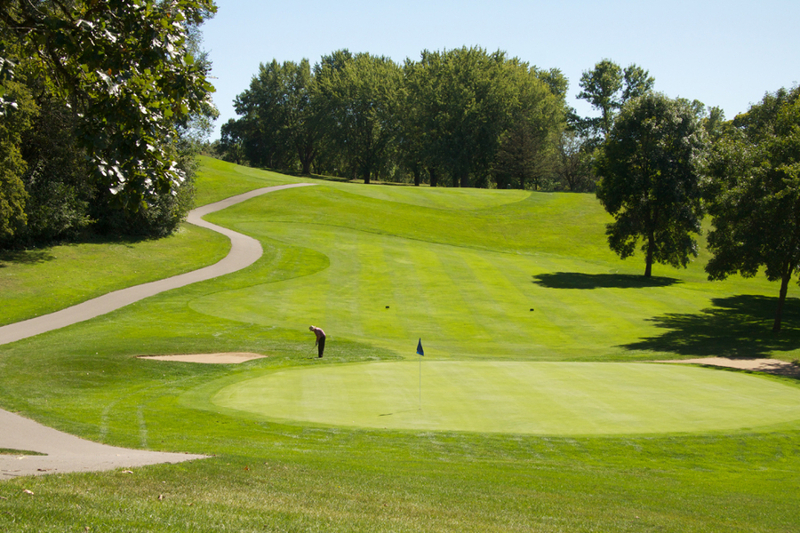 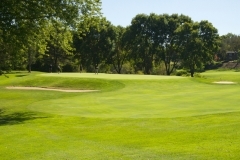 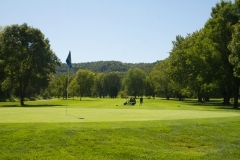 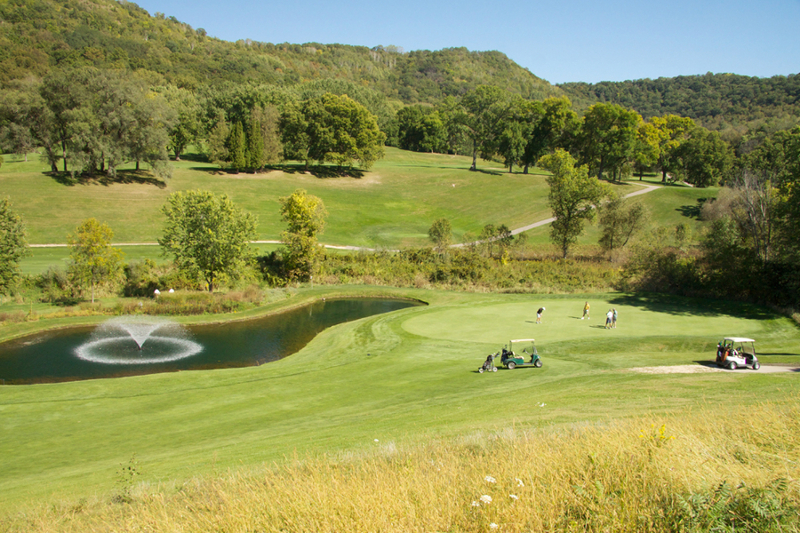 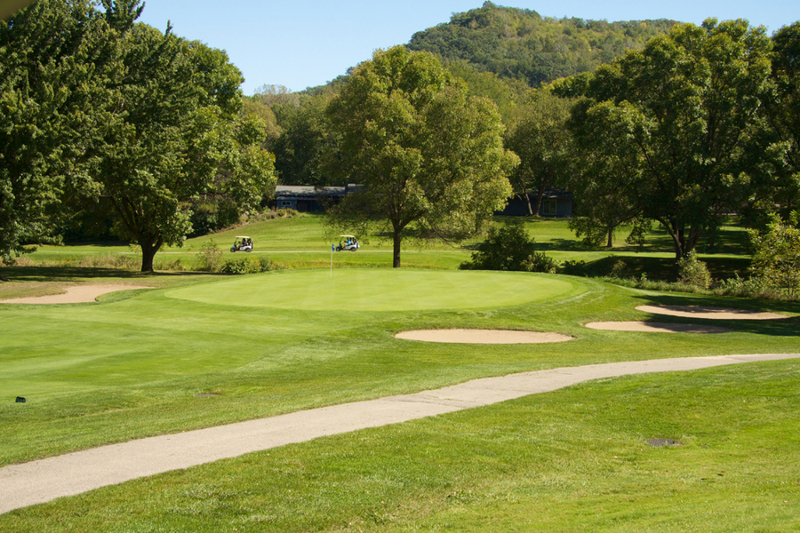 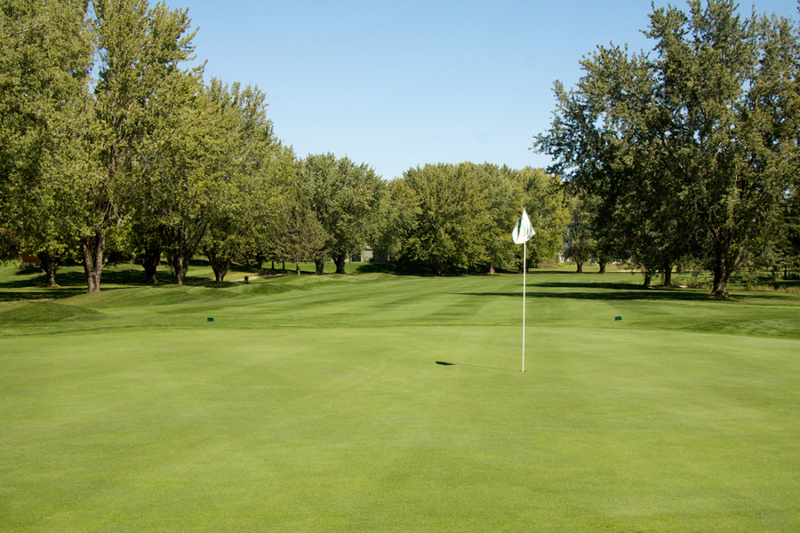 Robert Trent Jones made the trip to Winona and incorporated seven of the existing holes with his design, completing the 18-hole golf course layout we play today. 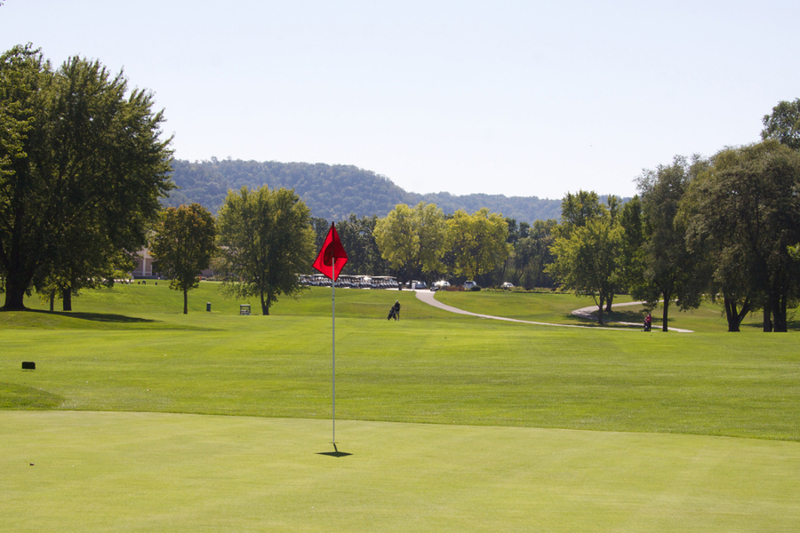 After your round, stop in at the Grill for a drink and a bite to eat, or invite the whole gang for fine dining at Signatures Restaurant. 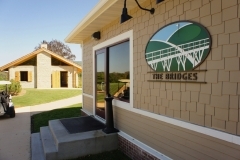 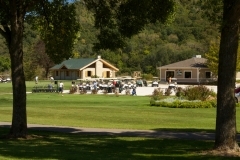 Bridges is also co-located with Visions Event Center and the Summer House, our newest retreat for outdoor events. 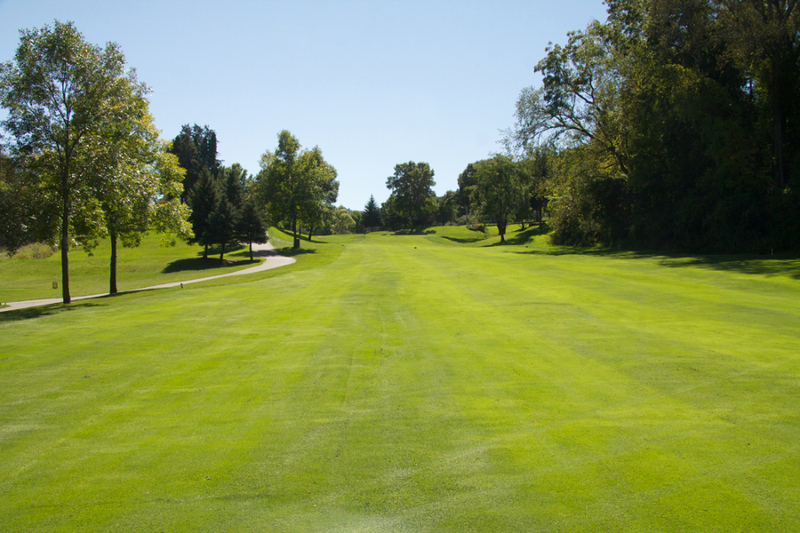 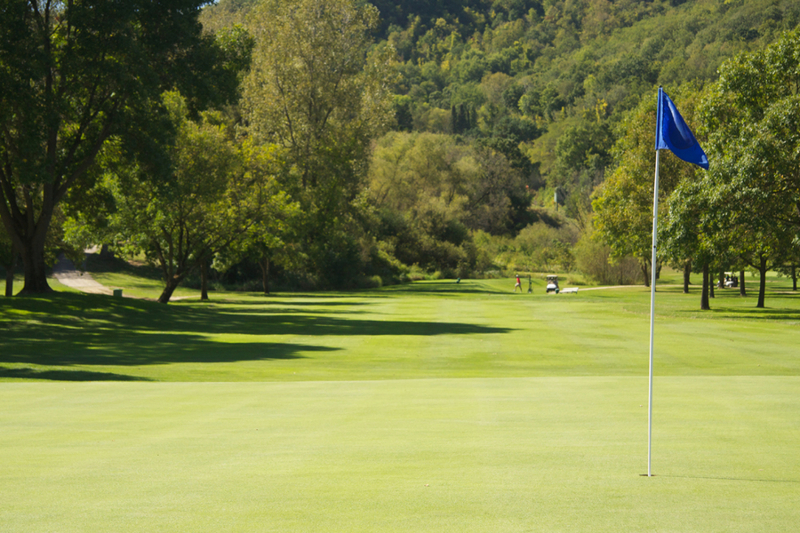 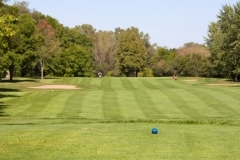 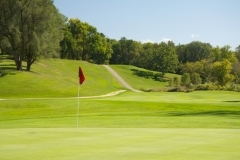 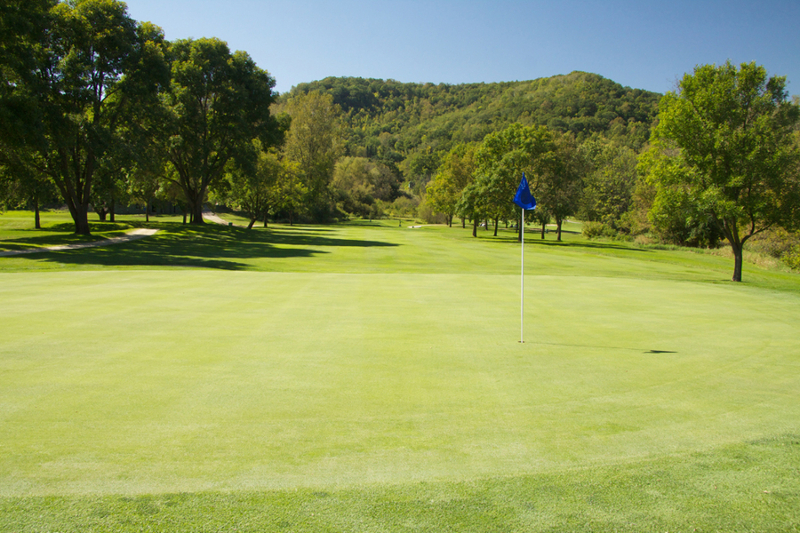 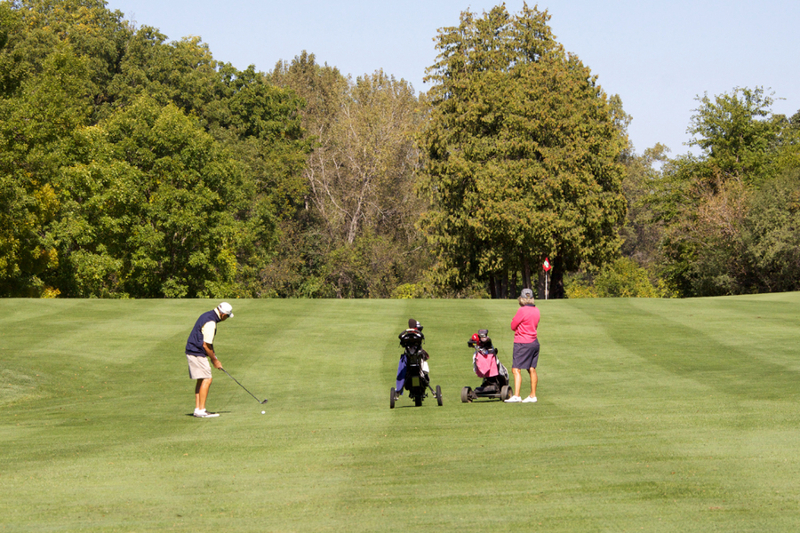 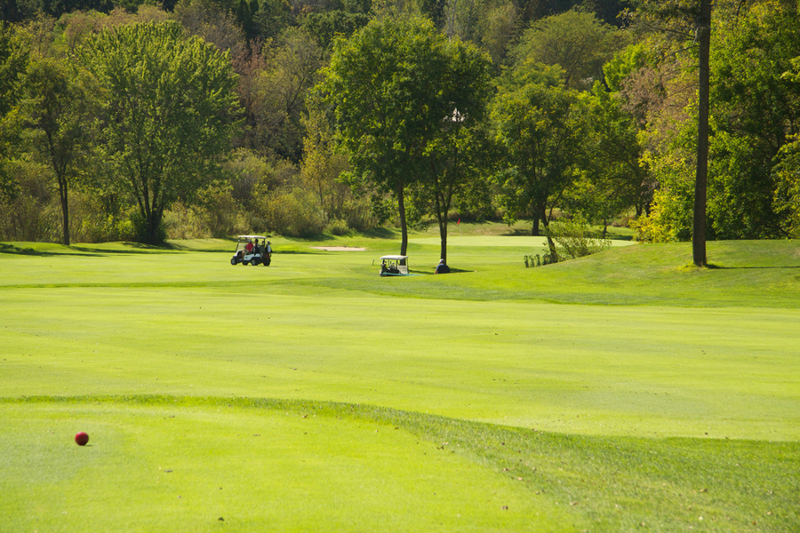 Click here to learn about the history of the golf course. Hole 1 – Re-grading the tee, adding an intermediate tee and a forward tee, reshaping the bunkers, adding drainage and new sand, moving the fairway bunkers slightly, adding drainage to the fairway and rough. Hole 2 – Re-grading one tee, adding a forward tee, reshaping the two bunkers into one with drainage and new sand. 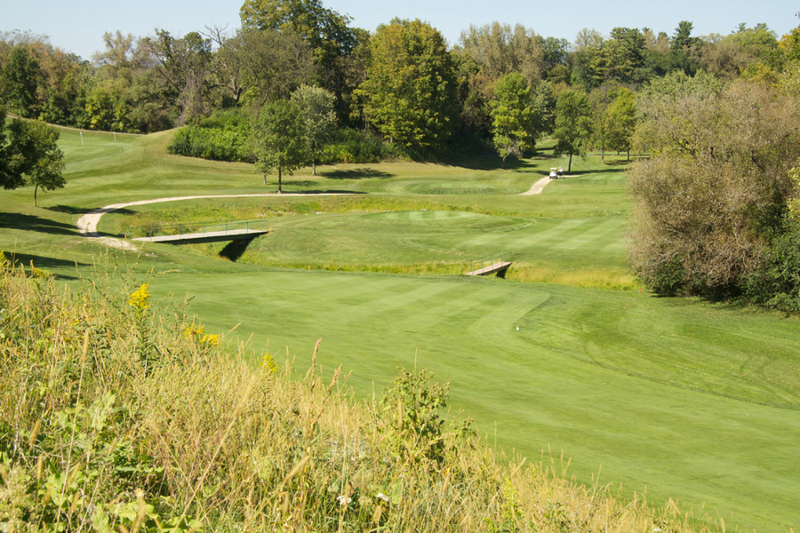 Hole 3 – Repairing the intermediate tee and adding a forward tee, re-shaping, draining and adding new sand to existing bunkers, removing the bunker left of the green, adding drainage to the fairway and rough with multiple catch basins. 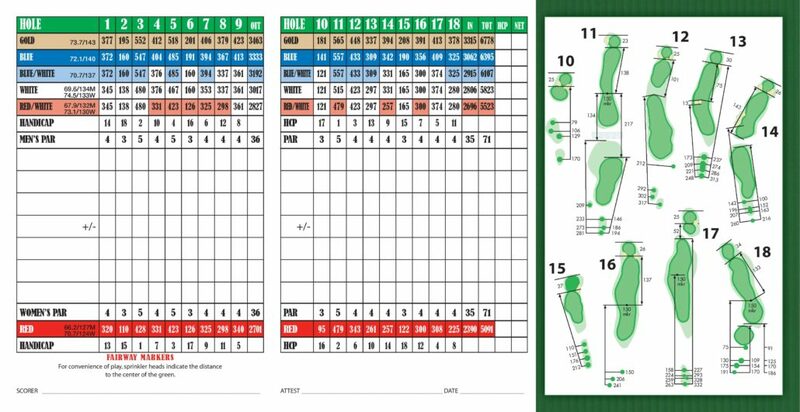 Hole 4 – Adding an intermediate tee, regarding the forward tee, removing the right side bunker, re-shaping the bunkers left of the green, removing the back left bunker and adding a mound short and right of the green for definition, adding drainage to the fairway and rough. 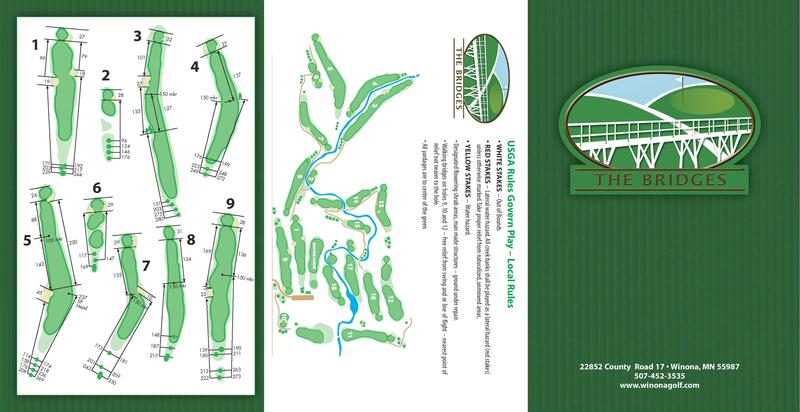 Hole 5 – Adding two intermediate tees, rebuilding and re-shaping the bunkers, adding drainage and new sand. 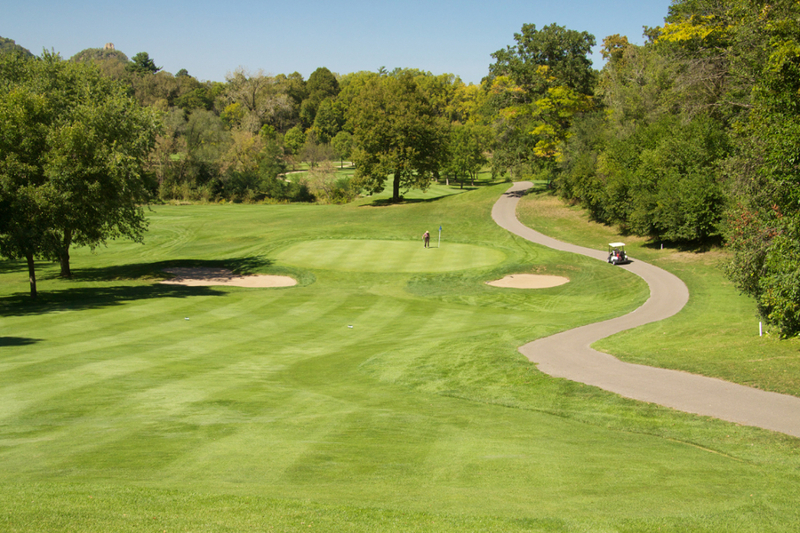 Hole 6 – Adding an intermediate tee, re-shaping, adding drainage and new sand to the bunkers. 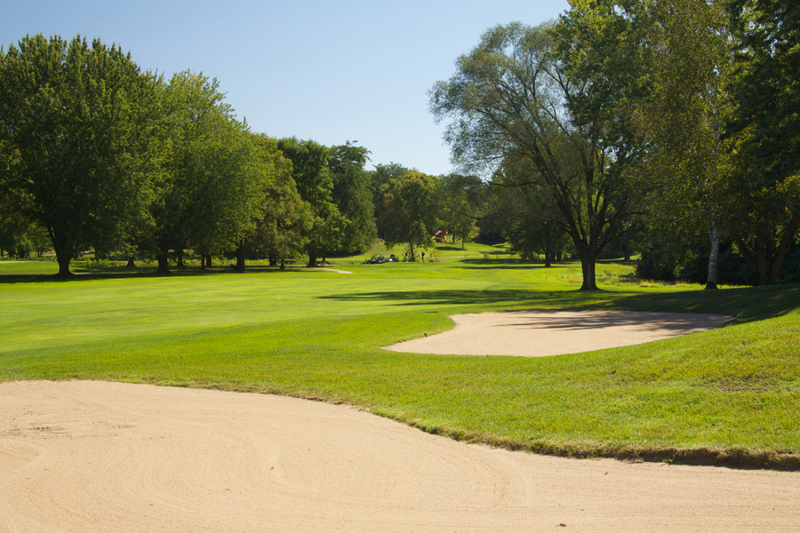 Hole 7 – Adding an intermediate tee, re-shaping, adding drainage and new sand to the bunkers. 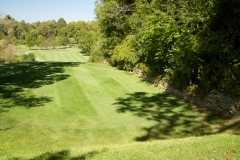 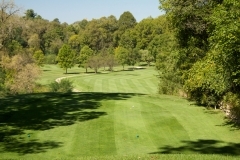 Hole 8 – Adding an intermediate tee. 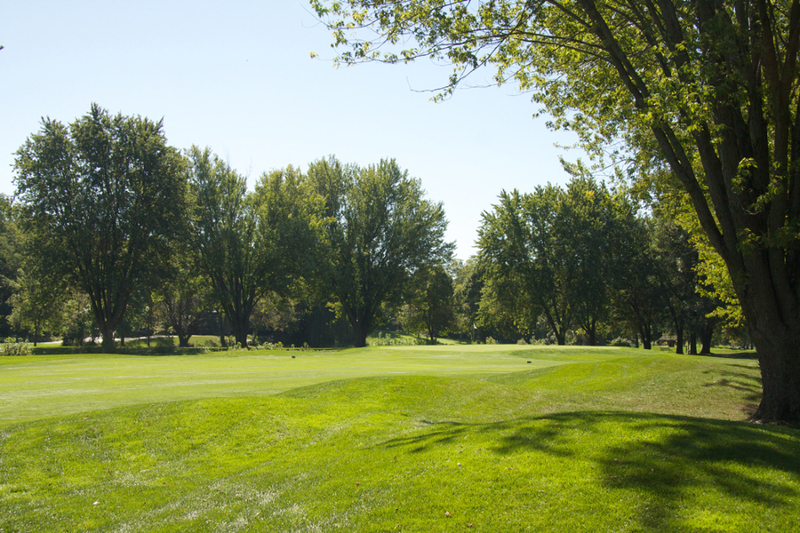 Hole 9 – Adding a forward tee, re-shaping the intermediate tee, rebuilding and re-shaping the bunkers, adding drainage and new sand. Removing the bunkers left of green. Hole 10 – Adding a back tee, re-shaping the current tees, re-shaping, adding drainage and new sand to the bunkers and removing the back left bunker. Hole 11 – Adding an intermediate tee, re-shaping, adding drainage and new sand the bunker. 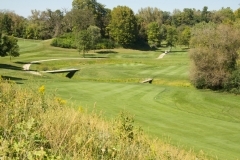 Hole 12 – Re-shaping one tee, adding a forward tee, removing the front right bunker and the back left bunker, re-shaping, adding drainage and new sand to the remaining two bunkers. 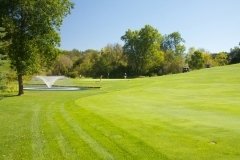 Hole 13 – Adding a forward tee, adding a fairway bunker complex with two small bunkers, building a new green making the hole from the regular tees approximately 300 yards long. Hole 14 – Adding a new back tee and forward tee, re-shaping, adding drainage and new sand to the bunkers, adding drainage to the hole. 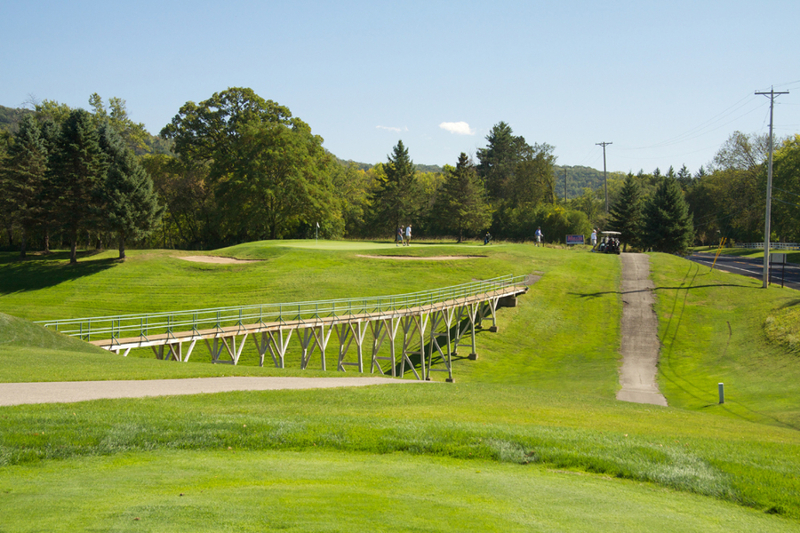 Hole 15 – Adding a new forward tee, re-shaping, adding drainage and new sand to the bunkers. 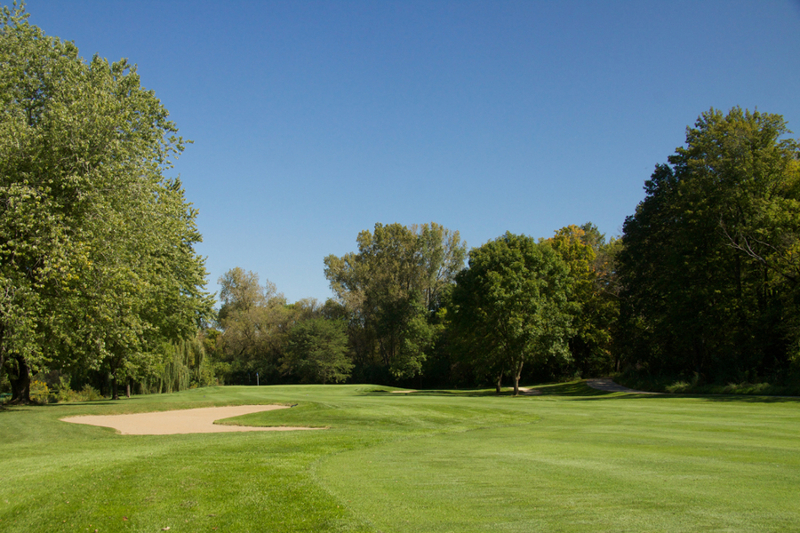 Hole 16 – Adding a new intermediate tee, re-shaping, adding drainage and new sand to the bunkers. Hole 17 – Adding a new forward tee, re-shaping, adding drainage and new sand to the bunker, removing the short right bunker and adding drainage to the fairway and rough with multiple catch basins. 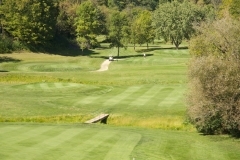 Hole 18 – Adding an two intermediate tees.